Here at A1 Black’n’Round we have invested in the latest Hunter Engineering Company Wheel Alignment System with the latest software to ensure we can confidently adjust your vehicle’s Toe, Camber, and Caster. In fact, we measure 14 primary angles on both front and rear wheels. Comparisons are then made against the vehicles manufacturer’s data for your specific car. The initial measurement should take no more than 15 – 20 minutes. Our alignment technician will then be able to discuss the findings with you, and explain what adjustments are necessary. When the adjustments are completed, you will be presented with a printout showing both ‘before and after’ measurements. 90% of cars on the roads today suffer from some form of mis-alignment. 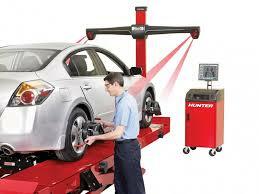 For some years now, manufacturers have designed their vehicles allowing both front and rear alignment adjustments. 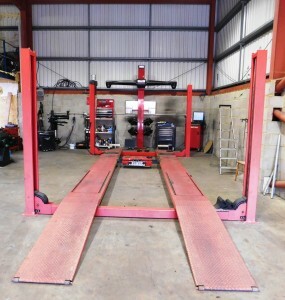 We accept that having a front tracking will not detect or solve the whole problem, thus our Hunter Wheel Alignment System will make sure that when you have a wheel alignment service with us, you WILL notice the difference in not only tyre wear, but your steering wheel will be straight, your thrust line will be true so no pulls etc. because your camber is correct to your car manufacturers specification. We also have Code-link, enabling us to re-set your steering sensors (where fitted), so that your auto-parking systems won’t park you in a wall! Many garages don’t do this as standard, overlooking the fact that after alignment adjustments, the sensor needs to be re-set!